I just came across an article on new.com.au on Jamie Oliver wand what went wrong with him and his brand. Wow, what if the other brand extensions also fail? Well, looks like you are up the proverbial creek and that is with or without a paddle (which is really immaterial, really). Jamie Oliver had a relatively meteoric rise to fame, albeit he had some falls along the way. He had a likeable persona and seemed quite easy to relate to. Now, as he expanded his cookery appearances to his own shows, he also diversified his brand (his persona) into: books, cookware, restaurants, etc. Overexposure. This is always a problem for public figures like actors, TV stars, including celebrity chefs. But, just how much is too much exposure? I’m not sure how to quantify this, but suffice it to say, that such figures have to consider this everytime they are asked to appear as guests on a TV show, asked to participate is an event that will be televised, guest spot on a TV show or feature film and so on. Now for the other points put up: a disconnect between his actions and his personal brand. One point noted in the article states thus, “Ms Pollard said one possible reason behind those failures was the mismatch between Oliver’s “average Joe” identity and the up-market feel of his eateries. “You can buy one of his books for $20, or watch his TV show for free. But a lot of his restaurants sold expensive meals … which didn’t really stack up for people,” she told news.com.au. Having been to one of his eateries here in Sydney, I can attest to the expensive meals. And, to be honest there was nothing in the meal I ate that warranted the price. Mind you, my kids liked it. Well, as the one who paid the tab, I could say I had better for the price. But, I digress. Also, part of the disconnect mentioned in the article is Oliver’s signing up with Shell, going against his green credentials. But, a 9.1 million dollar contract was probably to hard to refuse. And, according to the article, he did not do any interviews to explain the reason for this signing up with Shell. So, his audience thought he had something to hid. Wow, this could have been prevented to easily. Better to have not said anything. Mind you, I speak with 20:20 hindsight. Other points made include the public spat with fellow celebrity chef, Gordon Ramsay. 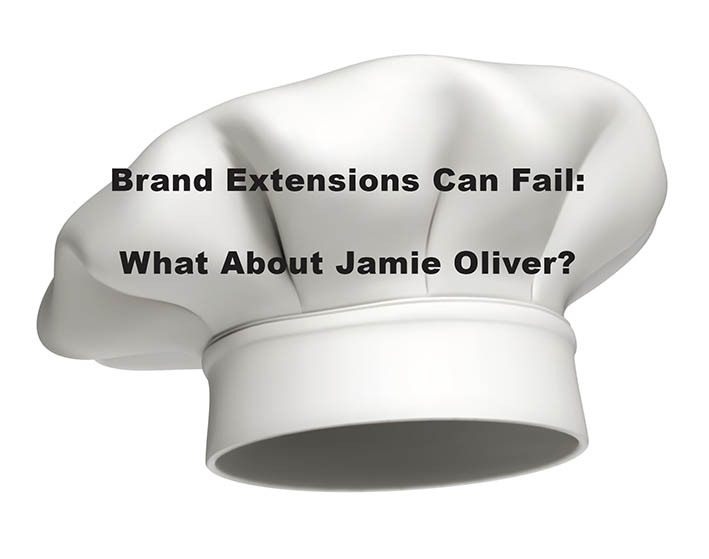 In my blog post, I noted that one of “the golden rules of brand extension is to use the strength of Oliver’s reputation and strength of his brand to extend this. Diversification allows you not only sell more products but also to spread your risks. As whatever you sell when you reach a point of saturation, diversification allows you some protection from that saturation by selling other products. So, like anything in life, there are no guarantees. And, one really has to watch his steps in any venture, especially remembering to consider consequences of every action. Every celebrity knows this, but hey, it’s so easy to forget or not think stuff through.